Kevin previews the trip to Essex, and reflects on football topics at Priory Lane and beyond. 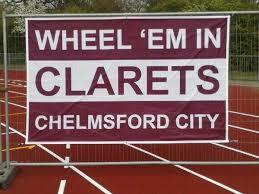 A first away fixture since the end of September takes Eastbourne Borough to Chelmsford City tomorrow (Saturday) – with their own rather proud little record to maintain. The Sports are the only club in National South who remain unbeaten away from home, and manager Jamie Howell says it’s not not just chance or good fortune. “Including the FA Cup, we have won three games away from home, and drawn four – but two of those draws should really have been two more wins. At Dartford and at Gloucester we were leading until deep into stoppage time. The Sports have not failed to score in any game since the opening day of the season – a goalless draw at Oxford in a furnace approaching 40 degrees. Alfie Rutherford’s return to parent club Havant, after hitting six goals in five games for Borough, is a blow but not unexpected. That last comment comes with a chuckle. Sergio Torres, despite being in sensational form all season, had not actually scored until Tuesday’s home game with Hampton, and there were smiles all round when the popular club captain finally broke his duck. With Lloyd Dawes fit again alongside Charlie Walker and Yemi Odubade, Howell will probably perm two strikers from three to start against Chelmsford. The Clarets themselves, usually one of the division’s strongest clubs, have enjoyed mixed fortunes this season. They have notched only one league win at home this season, rather undermining the Melbourne Stadium’s fortress reputation. Off the field, the Clarets seem to be in transition, with a restructuring and take-over in process. Just this week, club chairman Steve Shore held a Q&A with supporters to update them. A new ground seems frequently to be on City’s agenda, but for the moment they remain tenants at the Melbourne, which was designed as an athletics stadium. City manager Rod Stringer, under some pressure at a club which tends to expect success, bolstered his squad this week with the signing of former Sports centre-back Kiran Khinda-John – surprisingly released by Woking, for whom he turned out at the Lane on August Bank Holiday. Kiran never quite fitted the bill at Borough, but he has many admirers and will be looking to make a point. Stringer has also brought in Chez Isaac, the gifted midfielder formerly with Braintree Town. But neither new signing could prevent the Clarets from slipping to a 3-0 midweek defeat at Concord Rangers, blown away by three early goals. Meanwhile, of course, the Sports were battling out an entertaining 2-2 draw with Hampton. “That was probably a fair result,” said Howell. “We had a crazy ten minutes at 2-0 up and Hampton pegged us back, but they are a very good side, and four points from the two home games is a decent return. Eastbourne United visit the Lane next Tuesday (6th) in the Sussex Senior Cup. The home side start as favourites, naturally, but Jamie Howell takes the competition seriously. With squad players likely to get some pitch time, and local honour at stake, Ryan Cooper’s newly reinforced side will be up for this one – and it should be a good night. Meanwhile, also on Tuesday, Hailsham Town entertain Chichester City and Seaford Town travel in hope to Bognor. And after that 3-0 win at Whitehawk on Tuesday, Town – the first club through to the Third Round – can afford to be rather pleased! Now then, Jamie has his critics. So, before him, did Tommy Widdrington and Garry Wilson. No problem with that, for the fans are the paying customers, but thankfully it seldom gets too vitriolic at the Lane. If you follow the Sports – or indeed any of our other local clubs – you learn to cheer the successes and sigh with the disappointments, and hope that they at least level out. Long-suffering but loyal. The last few weeks have tested the patience a bit, and the FA Cup exit to Slough Town was hard to take, and yet attendance figures are actually up this season and fans can spot the progress. “Absolute shambles, children’s party time. Are our players colour-blind?” - “Shocking, pathetic, clueless, worst performance ever...” Don’t sit on the fence, chaps. In fairness, this sort of barrage of anger happens on most forums from time to time, especially in defeat, and especially in the heat of the moment. And I suppose passionate is usually preferable to passionless. The Borough Unofficial Forum tends to be a bit sleepy, and one contributor the other day wondered if it should close. Either that, or it needs a new infusion of cordial debate. But… How different was the Lane last Saturday – where Jamie, in the busy hour before kick-off, paused to give a group of supporters sitting in the main stand nearly ten minutes of his time, in serious but friendly discussion of team and tactics. No wonder the fans are on board with him. What a pleasure to see Andrew Briggs for that last quarter-hour against Hampton. Not a meaningless token substitution but a chance for 18-year-old Andrew to change the game – and he very nearly did. Briggsy has served long hours on the bench and chalked up a lot of miles on away trips. Like Harry Ransom a year or so ahead of him, he will surely get further chances, little by little, to prove he can handle National South football. Former England striker, turned pundit, Chris Sutton was not wrong in slating the state of the Wembley pitch on Monday night. Damage from the previous day’s American Football game was evident, not quite the fiasco of the Horse of the Year Show – remember that? - but poor event management. But marksman Sutton was wide of the mark with his comment that it was like a non-League surface. Our friends at Bognor, whose pitch is perfect enough for a World Marbles Tournament, seized on the remark with a tweet “Chris, we’d love to welcome you as guest to Nyewood Lane with our carpet of a pitch!” He missed a decent game, too, Rocks winning their FA Trophy replay 4-3 on penalties…. What a bleak weekend we have just endured: the devastating helicopter crash at Leicester City, and Glenn Hoddle in intensive care (although thankfully improving). Nobody is spared. Here in our little footballing corner, we have been speaking a lot recently about players’ health, about the well-being of all our extended club family, about abilities and disabilities. And elsewhere on the club website (and in this week's Herald), Chris Munns introduces himself and outlines his thoughts about taking on the role of Disabilities Liaison Officer. It all dovetails together, and we are all involved. What’s especially impressive is that – locally and nationally – sportsmen and women can set aside their status or fame, and any “aura” of being special. Medical conditions take no account of celebrity. Just last week, Caroline Wozniacki stunned the tennis world by revealing that she has rheumatoid arthritis. It’s a maddening condition, trust me, which leaves you aching and fatigued. I’ve met Caroline more than once at the Eastbourne Tennis, and she is a charming, courteous, model sportswoman. She won’t let it defeat her though. Her condition was diagnosed back in the summer, and incredibly she has won WTA tournaments since then. I know how you feel, Caz. This bloody RA has left me creaking for fifteen years now; and I realise others of you out there are coping with similar, or worse, issues. Hang in there. And Gary Lineker is currently fronting a Stand Up to Cancer campaign, for which you may have watched his moving, heartfelt video, telling a very personal story. Gary’s son George was diagnosed with – and survived – childhood cancer. “At six years old, we were twice told to prepare ourselves that he might not last the night.” And now George is a strapping 26-year-old. Without at all trivialising, I know how you feel, Gaz. At six days old we were warned that one of our little ladies might not last the night. And now she’s a radiant 27-year-old. This summer, I was serenading her with some seriously embarrassing Dad-dancing at her wedding…. Nothing to do with Borough? Who knows. At least one member of our extended Borough family – maybe more – is dealing with some very testing family illness right now. But they aren’t fighting it alone. We all walk with them. Indeed faith, hope, love go with them stride by stride, and the will to win those battles is as tough as old boots.